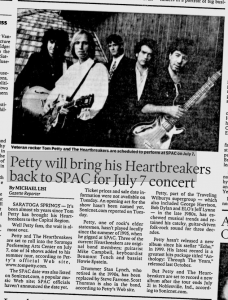 SARATOGA SPRINGS -- It's been almost six years since Tom Petty has brought his Heartbreakers to the Capital Region. Well Petty fans, the wait is almost over. 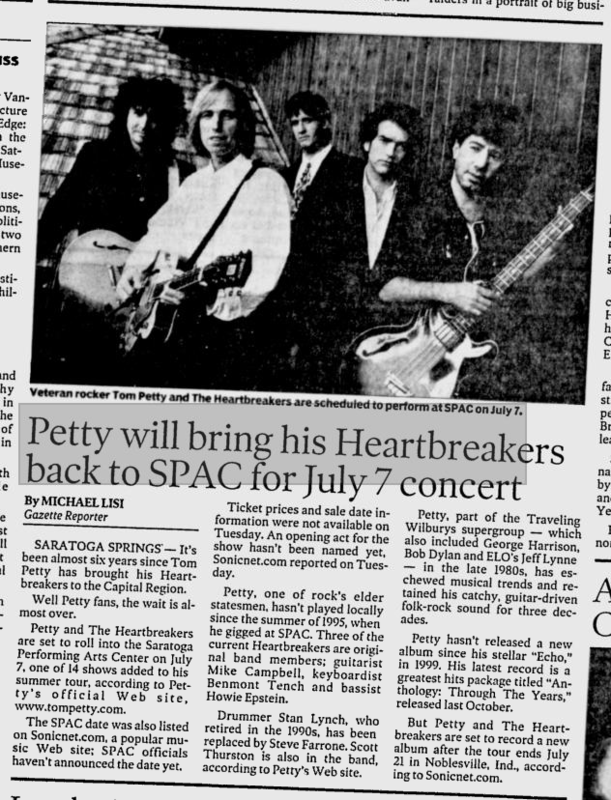 Petty and The Heartbreakers are set to roll into the Saratoga Performing Arts Center on July 7, one of 14 shows added to his summer tour, according to Petty's official Web site, www.tompetty.com. The SPAC date was also listed on Sonicnet.com, a popular music Web site; SPAC officials haven't announced the date yet. Ticket prices and sale date information were not available on Tuesday. An opening act for the show hasn't been named yet, Sonicnet.com reported on Tuesday. Petty, one of rock's elder statesmen, hasn't played locally since the summer of 1995, when he gigged at SPAC. Three of the current Heartbreakers are original band members: guitarist Mike Campbell, keyboardist Benmont Tench and bassist Howie Epstein. Drummer Stan Lynch, who retired in the 1990s, has been replaced by Steve Farrone. Scott Thurston is also in the band, according to Petty's Web site. Petty, part of the Traveling Wilburys supergroup -- which also included George Harrison, Bob Dylan and ELO's Jeff Lynne -- in the late 1980s, has eschewed musical trends and retained his catchy, guitar-driven folk-rock sound for three decades. Petty hasn't released a new album since his stellar "Echo" in 1999. His latest record is a greatest hits package titled "Anthology: Through The Years," released last October. But Petty and The Heartbreakers are set to record a new album after the tour ends July 21 in Noblesville, Ind., according to Sonicnet.com.